Love it or hate, there’s no denying that plastic is unique! Plastic is the result of a process that takes hundreds of millions of years to transform ancient forests and algae into petroleum and natural gas under the earth. Plastic is also the result of a century of focused human innovation to create such miraculous things as photographic film, water-fast containers, and all sorts of devices that enable our modern life. For the last decades, the unique properties of plastic have been used more and more by large corporations to further their global business. Plastic has served the global corporations at the expense of local communities and ecosystems – where it has been locally dumped and burned. With ecobricks we have a chance to turn this all around, and put plastic to use to benefit local communities and ecosystems. With ecobricks, we use the characteristics of plastic that were once so problematic – longevity, durability and water fastness, and instead put it to good and green use. Ecobricks trap plastics out of the biosphere. “The problem is always the solution” – Bill Molison, on the founding principles of permaculture. Plastics in the biosphere disrupt the cycles of life. Ecobricking allows the long term retention and control of materials that in all other eventualities would become toxic. Ecobricks make use of the very problem (the longevity of the plastic) to seal the potential toxins away. Plastics break down and contaminate to the extent that their surface area is exposed to the elements (in particular the sun, water and friction). By ecobricking plastics into a bottle, the net surface area of the plastic is reduced by a factor of several thousand. By ecobricking only clean plastic, the build-up of methane gas is prevented. By sealing the bottle, the degradation of plastic becomes all but impossible. Because of the incredible longevity of PET that is protected from UV rays, ecobricking effectively traps plastic indefinitely within a bottle. Of course, it is important to build properly with ecobricks to prevent degradation. Download and follow our building principles and techniques when using Ecobricks: The Vision Ecobrick Construction Guide. Ecological consciousness is the awareness of one’s connection to the cycles of life that we are part of. Plastic pollution is fundamentally caused by short sighted, linear thinking and ignorance of plastic’s properties. Many people don’t realize just how dangerous and toxic plastic can be– they thus continue consuming, tossing, burning or recycling their plastic. Ecobricking addresses this directly. All of our training materials begin by introducing the potential dangers of plastic. Perhaps most significantly, the hands-on process of making an ecobrick raises the maker’s ecological consciousness. For those who make Ecobricks, they know it is a laborious task– it can take hours of dedicated work and a large sack of plastic to make a single 1.5L Ecobrick. The process is inherently meditative. It lends itself towards existential reflection on each piece of “trash” being stashed. It gets Ecobrickers reflecting: Where did this plastic come from? Where is it going? Why is it here? Where will it be in 100 years? Would it be better to just grow my own coffee? To honour future generations and other species, we must begin by thinking of them. Ecobricks provide an invaluable spark to such reflection (this very article and your reading of it is an example of this). Ecobricks become a catalyst to envisioning one’s lifestyle in deeper harmony with the circles of life. Ecobricks enable citizens to take plastic out of the industrial recycling system, which thereby keeps it out of the biosphere and saves energy. When plastic is “Recycled”, it re-enters a globally distributed industrial system that consumes large amounts of energy and relies on humans working in toxic conditions. In addition, all plastics that enter this system eventually find their way out, and into the biosphere. Contrary to common belief, recycled plastic does not get recycled into the same kind of plastic. When used plastic is melted down into a base pellet for reuse, it’s rarely into the same category of plastic it was first. For example, a plastic PET bottle isn’t recycled into another PET bottle, but into a lower form of plastic, with less value. Worn, dirty and broken the plastic can only be down-cycled into a form of plastic with less value. Because of the lower value, the likelihood of this being recycled is reduced with each cycle of the “Recycling”. With each “cycle” the chances of the plastic being dumped or leaked into the biosphere increases. Inevitably, all plastic in the Industrial recycling system will end up in the biosphere. Furthermore, the industrial recycling system bounces plastic around the globe in a high energy journey. Plastic gets bought and consumed in America, then shipped to Germany for processing, then back to Asia for re-manufacturing. This journey involves massive shipping containers, trucks, boats, factories and more. The nodes on this journey, factories, recycling sorting plants and superstores, push humans into jobs that are often completely cut off from the outside world (sunshine, fresh air, fresh water, fresh food are not there) and instead into noisy, chemically intense locations for long shifts. 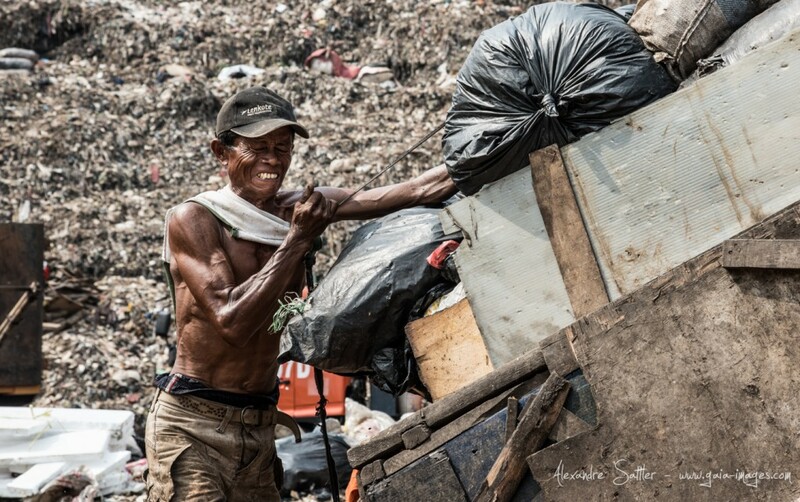 In many countries, “trash pickers” labour under the hot sun in noxious dump sites to process and sort plastics for “recycling”. In contrast, Ecobricks help put a stop to the downward Industrial spiral by simply removing it from this global system. Instead ecobricks keep plastic local– thus saving energy and cutting our support of inhumane working conditions. Ecobricks, and all the applications on our site, are fundamentally Cradle-to-Cradle. This means, that the next life of the Ecobrick is planned into the creation that we make out of them. Everything comes to its end. Alas, pollution is caused by short sighted thinking: not planning the end into a product design. The vast majority of the products we use today go from their birth in a factory, into our hands, into their grave– which is always someplace within the Earth’s biosphere. This is a particular problem with plastic, as it long outlives the product’s usage. Pollution is the result. With Ecobricks, we do things differently. Learning from the endless cycles of life, we use Ecobricks in a way that anticipates their next cycle. Instead of a straight line of cradle to grave, we can draw a circle. We can make sure our Ecobricks go from one cradle to the next, to the next. This is the spirit behind Ecobrick Modules and LEGO. This is the concept behind the minimal use of cob in Ecobrick construction. Ecobricks empower citizens and communities to go zero-waste. Many people, communities and companies feel they need to rely on an outside facility to deal responsibly with their plastic. Most traditional recycling systems cost millions of dollars. With ecobricks there is no need for a big recycling plant or a giant Incinerator. Ecobricks allow individual and community action (without the need of special skills, equipment, facilities, finances or political permission), to transform flows of plastic into useful, zero-cost and indefinitely reusable building blocks. Individuals can start right this moment to take charge of their plastic: all that is needed is a plastic bottle and a stick. Once started, Ecobrickers are empowered to go 100% zero waste. Ecobricks allow the local re-purposing of plastic for practical applications. The utility of plastic has been traditionally used by large corporations to ship cheap, long-lasting products around the world and further their empires, no more! The appropriation of plastic from the global system lets it be put to use for local benefit. With Ecobricks, you and me, schools and communities can put their plastic to use locally. Ecobricks can be used to build all sorts of great stuff! See our building page for more details. To re-use the material of a simple plastic bottle the global industrial recycling system uses a vast amount of energy. Plastic is first collected by trucks and delivered to a sorting facility involving massive machinery. The plastic is then shipped across the world to a foundry to be turned into raw materials. These raw materials are then sent to a factory to produce a new product. This product is then shipped around the world to a store. In contrast, Ecobricking and the application of an ecobrick takes place within the circle of one’s community. The consumed plastic is put to use locally– no machines, transportation or high energy systems required. Traditional waste management systems require giant budgets, proprietary technology and vast amounts of energy to run. The recycling of plastic bottle can result in plastic bouncing around the planet from a store in Canada, to a foundry in China, to a factory in the Philippines, to a river, to the ocean. Often, as soon as a city builds a recycling plant, there is already more plastic than capacity. Plastic is made from petroleum molecules, which are made from oil. The burning of plastic (globally one of the most common forms of plastic disposal) generates 3.1Kg of C02 per 1Kg of plastic. When plastic is left in the sun, C02 is also released in the photo-degradation process. The release of C02 is one of the major causes of global warming. By packing plastic into a bottle to make an Ecobrick, we keep plastic from being burned or degraded. When ecobricked, the net surface area of all the plastic packed is reduced by a factor of thousands – proportionately reducing the UV exposure. The density of a packed ecobrick (typically between 30-40g/ml) also makes it very difficult for an ecobrick to combust. When used in a cob construction, there is no chance for UV, heat or friction degradation. The plastic’s C02 is effectively sequestered indefinitely– just as untapped oil beneath the Earth is a natural storage of C02. On average one 600ml Ecobrick will sequester 0.62kg of CO2 and a 1.5L Ecobrick will sequester 4.6Kg of CO2. Ecobricking technology is designed from the ground up to be accessible, simple, and do-able without expense, machines, or special equipment. This site as well as others around the net, share methodologies and innovations, without charge, using the Creative Commons free-to-distribute license. Consequently, there is no profit or exchange of capital involved in the making of ecobricks or their application. The motives for ecobricking are thus radically different from the for-profit exigencies of industrial recycling, waste-to-energy, incineration, and other large scale, proprietary technologies. The current production of plastic continues to increase at a significant linear rate. Traditional industrial recycling systems cannot keep up. Ecobricking, as a low-tech, open-source solution, spread within a social region virally — quickly surpassing the rate of local plastic consumption. In the city of Jogjakarta, the municipal government saw the spread of ecobricking to each of its 453 neighbourhood units within several months. In the Northern Philippines, ecobricking spread through the entire school system, involving 250,000 students, within one year. In the city of Bontoc, ecobricking helped reduce the municipal plastic output so dramatically, that the local dumpsite was closed within six months. In each case, when introduced methodically, ecobricking results in a dramatic dent in the actual amount of plastic waste produced in a community over the short and long-term. Plastic Degradation and Its Environmental Implications: A journal article of the different ways plastics degrade into biological toxins. Is there a connection between the pollution of the planet and of our bodies? We explore this question and more in our VEB resources.